OK Savvy Shoppers…Who Can Tell Me What These Are? | Keep It Up, David! 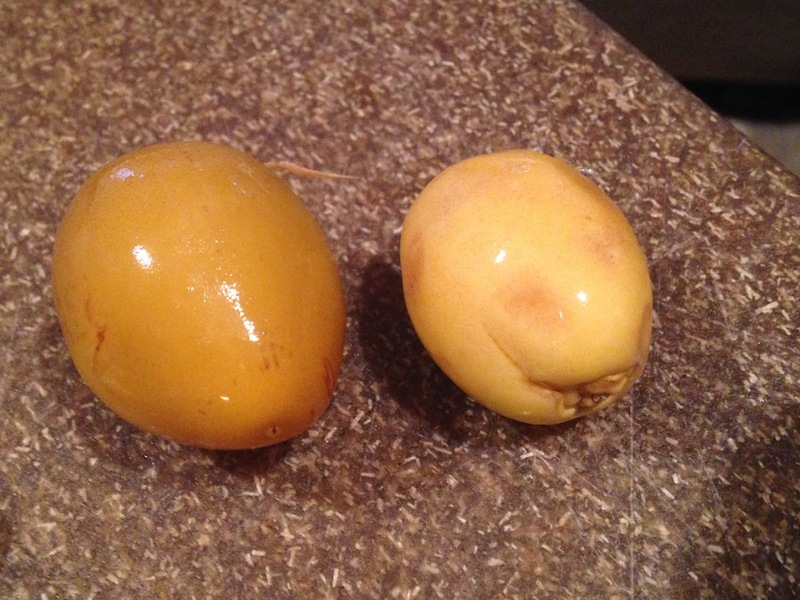 …DATES! I’ve only seen them dried before, so seeing them fresh really threw me for a loop. 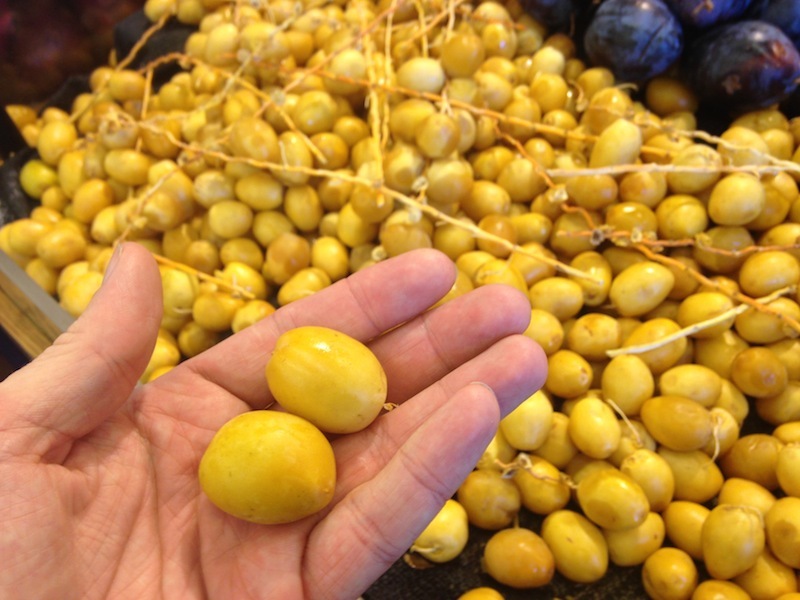 Dried dates are a much deeper brown or purple, like raisins or prunes, but fresh dates are yellow? Go figure! 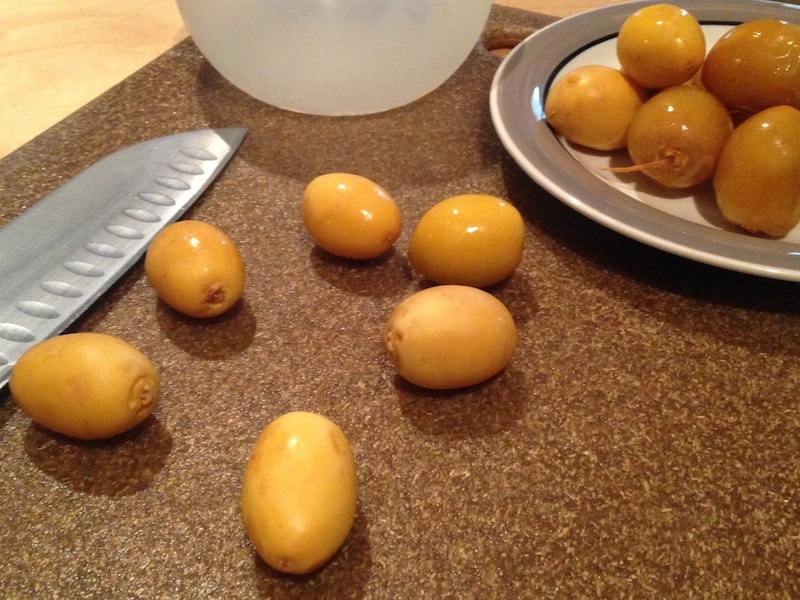 So I couldn’t wait to get my hands on these fresh dates. A brand-new experience involving a food I love? Sign me up! I brought home about 15 of them. 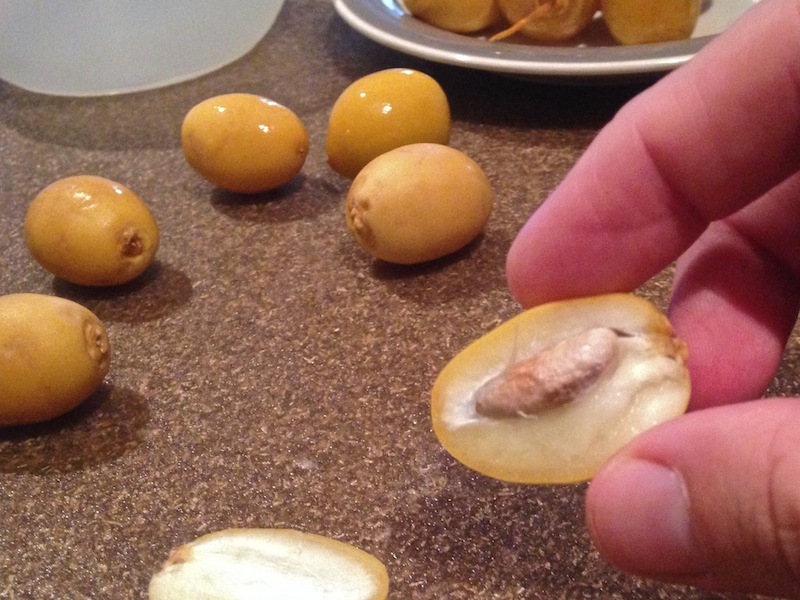 Fresh dates are hard to the touch, super smooth, almond shaped, and about the size of large grapes. The cashier at the store said to wait a few days, because the softer they are, the sweeter they are. So I waited a few days, and then I couldn’t wait any longer. The first thing you have to contend with in a date is the pit. I knew there’d be one in there, because every package of dried dates I’ve ever purchased has been labeled ‘pitted dates’ – so you don’t need to be Nancy Drew to put two and two together. …but it pops out pretty easily. The taste was completely unique. Well, actually, I should say the mouthfeel was unique. The taste was completely familiar – just like its dried compadres – it’s just that the flesh was crunchy and dense, like an apple, and not soft and chewy, like dried dates are. It was kinda cool and exotic to taste such a familiar flavor in a different form! RELATED CONTENT: This Melon Has Spines and Will Hurt You! 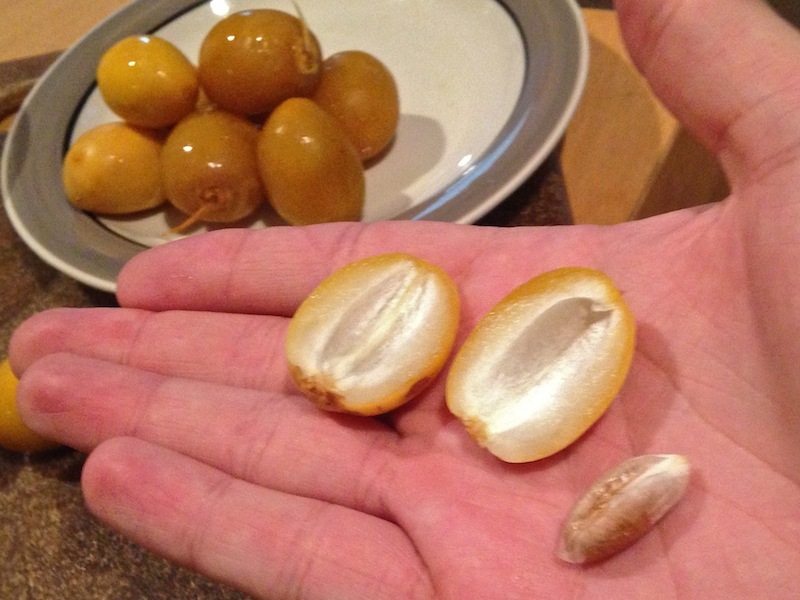 Some of the dates I purchased ripened faster than others. The softer ones got to be a deeper yellow, almost brown, and they also developed a slight sheen, like they were wet. Just like the cashier said, they were slightly softer and sweeter. And delicious! Well, all of them were delicious. Dates are a good natural source for potassium, magnesium, calcium, fiber, vitamins A, B-6, and K, and antioxidants known as tannins. And buying them fresh, if you can find them, probably means that you’ll eat less of them, because of the time and effort needed to cut and pit them! I wonder what I’ll find next? This entry was posted on Thursday, October 15th, 2015 at 12:53 pm and is filed under Uncategorized. You can follow any responses to this entry through the RSS 2.0 feed. You can leave a response, or trackback from your own site.